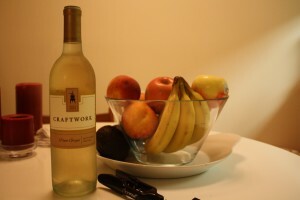 It smelled like honeydew when I stuck my nose into my first glass of Craftwork’s 2012 Pinot Grigio, but when I drank it, I forgot about that alluring scent. I expected a fruity concoction, but was distracted by the alcohol burn. The bottle says it’s 13.5%, but it tasted like more. I feel like this wine, because of the bite, would do well in a white sangria. I’m usually a fan of Pinot Grigio, but I don’t think I’d pick this one up again. It’s not a bad, but it wasn’t for me. Unfortunately, I picked up two bottles at the most recent Bevmo 5 cent wine sale. I was hunting for Pinot Grigio and this one had 91 points, so I snagged it. Lesson learned: points can be deceiving. Have you ever disliked a highly rated wine? Tell me about it. When to drink: If you’re making a white sangria, I think this wine would go well with a few shots of clear liquors in your cabinet, peaches, raspberries and a splash of bubbly.